When you are buying a new car, a used vehicle can be one of the best values you will find. With a much lower price tag, finding a used car with relatively low mileage, modern safety and convenience features can be a task and a half. Unless you’re looking at a Honda. Consumer Reports scoured the used car options and compiled a list of the best deals when it comes to 2009-2013 vehicles in different categories. They focused on the models that show the most depreciation from their original retail price and current value but still met Consumer Reports’ criteria to be “Recommended.” That means despite the depreciation, you are still looking at reliable vehicles that good performance in their tests and average or above average safety scores. And guess what? 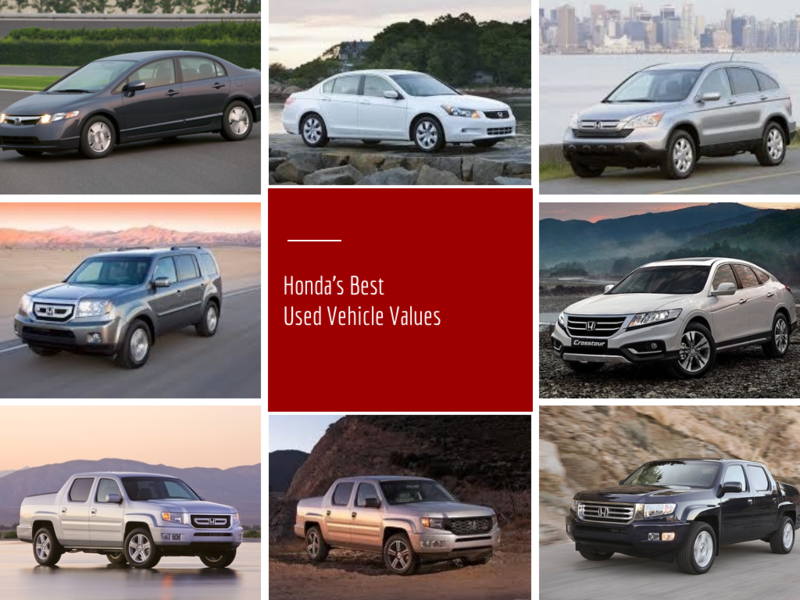 Honda has made the list…more than once. The 2009 Honda Civic retailed new at $20,105 and used with 106,000 km saw a 35% drop to $13,000, topping the Small Car category. Next up, we have the base model 2010 Honda Accord, retailing at $24,630. After being driven for 4 years and 83,000 km, the Accord came in second with a price 35% price drop to $16,025. How’s that for a great deal on a family car? Coming in first in the Small SUV category, the 2009 Honda CR-V has a 32% price drop from $23,495 to $16,800 after 5 years and 106,000 km. Coming in second to the Acura MDX, the 2010 Honda Pilot retailed at $32,345 but after 4 years and 83,000 km, it drops 32% to $22,500. The 2013 Honda Accord Crosstour rounded out the top 5 best valued wagons. After retailing new at $27,230, the Crosstour takes a 27% depreciation to $19,900 after one year and 18,000 km. The base models of the Honda Ridgeline took 3 of the top 5 positions in this category! The 2009 Ridgeline drops 39% from $28,200 to $17,175 after 5 years and 106,000 km; the 2012 Ridgeline went from $29,350 to $24,825 (that’s 15%) after 2 years and 35,400 km; and the 2013 Honda Ridgeline after just one year and 18,000 km dropped 10% from $30,195 to $27,100! How’s that for value? When you’re going used, you want to make sure you are getting the most bang for your buck, and these Hondas are the way to go. And don’t forget to make sure you are getting a Honda Certified Used Vehicle to make sure you get the reliability you expect from your Honda!